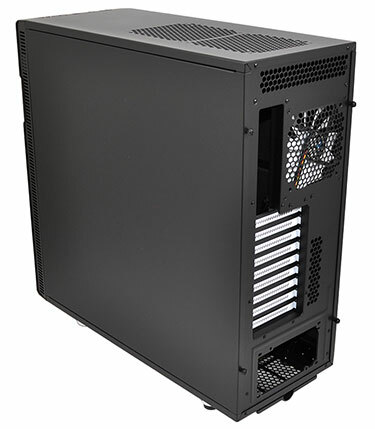 When we reviewed Fractal Design's Define R4 back in August 2012, we liked what we saw but felt as though the Swedish manufacturer could do more to spruce-up its tower enclosures. They're starting to feel just a touch too familiar. 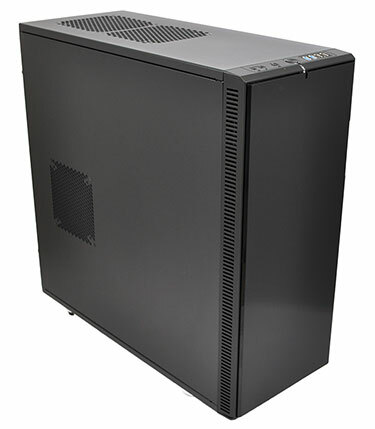 We've seen some differentiation since then - the company's HTPC enclosures are really rather good - but as far as high-performance towers are concerned, Fractal doesn't appear to be want to stray too far from the norm. Take for example the recently-launched Define XL R2. 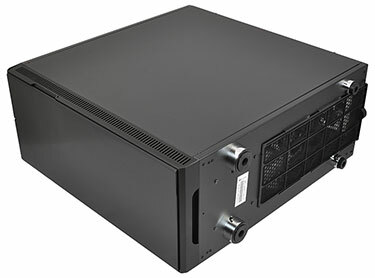 From the pictures it could easily be confused with the tried-and-trusted Define R4, but there is a comparatively big difference as denoted by the 'XL' branding; this isn't another mid-tower solution, it's a full-tower beast measuring 637mm (H) x 322mm (W) x 655mm (D). Yet it looks Fractal through-and-through. 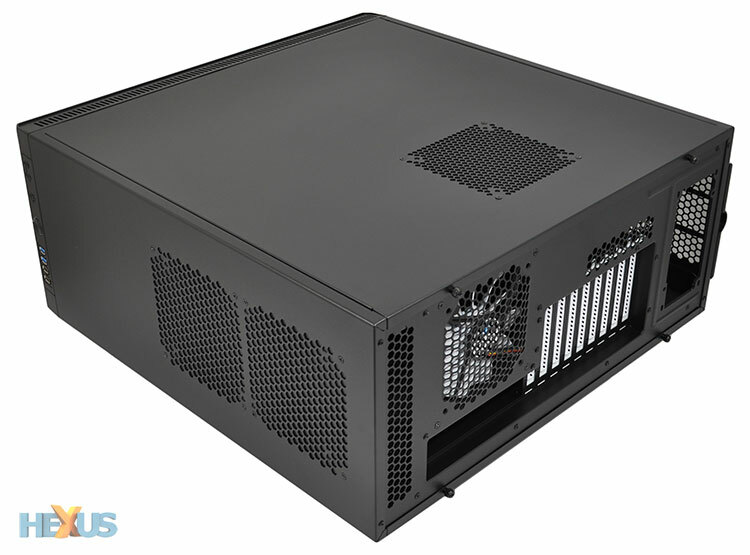 In keeping with the company's recent towers, the £105 XL R2 is an all-steel frame finished with a plastic front door that creates a clean, uncluttered look. Continuing right where the Define R4 left off, the top-front I/O panel provides a pair of audio jacks, power and reset buttons, an LED activity light and four USB ports (two of the SuperSpeed variety). Fractal has increased the spacing between ports - the entire I/O strip is a couple of centimetres longer than on the R4 - but considering the extra size of the XL R2, we were hoping to see more of an upgrade. Two more USB ports perhaps? Or better still, an SD card reader. Fractal clearly doesn't want to confuse the issue. 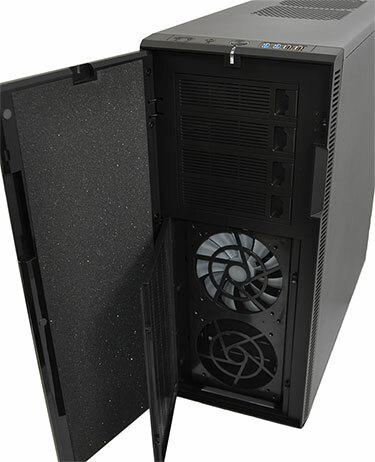 This full-tower option still has a soundproofed front door that opens just beyond 90 degrees to the left and can't be reversed, and behind the door you'll find four 5.25in drive bays (with plastic, pull-to-release covers) alongside a basic three-step toggle switch for the built-in fan-speed controller. The 5V/7V/12V controller continues to serve its purpose, but it looks and feels crude - it's the sort of toggle switch you'd expect to see on an '80s cassette player - and it only supports three fans, which isn't a lot for a chassis of this size. Below the optical bays, two front 120/140mm fan mounts are tucked neatly behind a filter, and Fractal stocks the upper mount with a 140mm Silent Series R2 fan. The XL R2's cooling potential is augmented by a further two 140mm blowers - a rear exhaust and a bottom intake. Should you need to go beyond that, a 140mm mount is integrated into the side panel (it's covered by sound-proofing foam by default) and two 120/140mm fan mounts are available in the roof of the chassis. Adding all that up reveals that seven chassis fans are supported, though remember only three can be hooked-up to the built-in fan controller. The Define XL R2 is exactly what you might have expected; a larger alternative to the well-received Define R4. And that itself tells you almost everything you need to know. The XL R2 is well-built, it's available in a choice of the usual Fractal colour schemes - Black Pearl (pictured) or Titanium Grey - and, most importantly, it's lined throughout with high-density noise-reducing material that aims to silence most high-performance builds. But is it worth the £25 premium over a mid-tower Define R4? That depends entirely on how much room you actually need, so let's see what the XL R2's larger area brings in terms of internal upgrades.